As the saying goes, “Good fences make good neighbors.” Besides keeping your yard or property out of sight, privacy fences can create a sense of intimacy in your garden or yard, and can also dampen noise pollution from nearby roads. 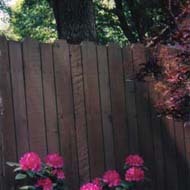 Wood privacy fences can be up to six feet high, and come in various styles (shadowbox, stockade, lattice) which afford varying degrees of visibility. PVC fences come in nearly as many styles as wood privacy fences. They can be up to six feet tall. Aluminum fences can be up to six feet in height. Although they won’t function as privacy fences (since there is always spacing between pickets) they can make excellent security fences for homes, businesses, public pools, and municipal properties. We also offer heavy-duty commercial and industrial-grade aluminum fences. Please contact us right away to speak with us about your needs and the fence that would be best for your property!